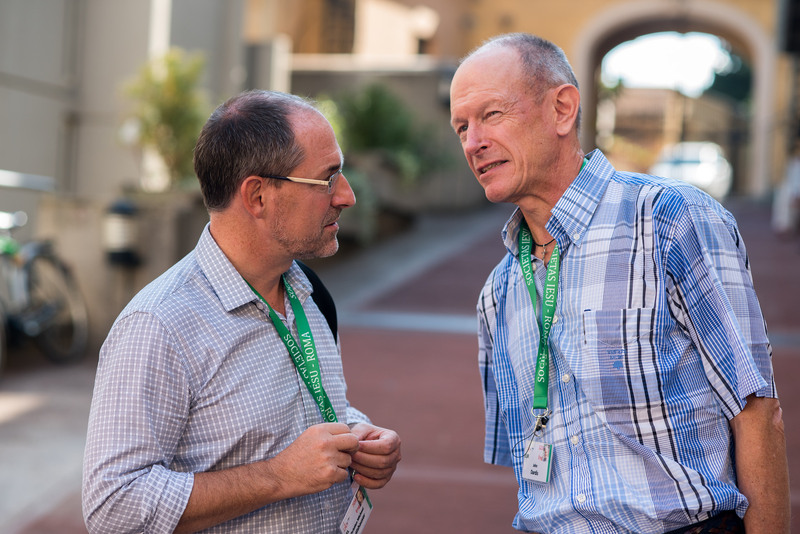 Over the coming days, the GC36 Media Team will share with you stories of Jesuits from different parts of the world. Today we caught up with Fr. John Dardis, a Jesuit from Ireland who is also President of the Conference of European Provincials. He shared his reflections on the contribution the European experience could bring to the General Congregation, starting with what was done in the previous phases of our gathering, at the end of 2015. He also reflects about his personal experience of the Congregation up to now. For the first time in the history of the General Congregations, the Conferences were called to play an active role before the plenary session. It is a way to recognize the universality of the Society of Jesus that it has to be integrated in its ways of proceeding. The European delegates gathered; there are more than 50 of us. We cover a large geographical territory from Ireland to Syria and Lebanon, from Sweden to Northern Africa. We did some work that was asked of us for the concrete preparation of the GC, but the important aspect was that we started to know each other and to think about the kind of issues that the Society of Jesus is facing today. How do we find our unity, being so different in many ways? I would say “by talking”. It sounds very ordinary, but when Jesuits share issues, concerns, when they share longings, aspirations, we overcome the language problems through our desire to serve Christ. Are there differences of opinions sometimes? Of course, and it is healthy; it would be unhealthy if it would stay underground. When I ask myself what the Europeans could bring to the Congregation, I think first of our struggles. We struggle with vocations for instance. We have made mistakes and we can share this as well. More broadly, I think that, when you think of the 20th Century in Europe, our history is dreadful: fascism, stalinism, all those “isms” that we struggled with, that we inflicted on one another and on the world. We also learned that ideologies can literally kill millions of people. So, facing the ideologies of today, secularism, consumerism, individualism that wound the human spirit, we might have something to say. We, Jesuits, have the Exercises, which are meant to bring liberation to people, liberation to help people to find God and find freedom from the “isms”, from the ideologies. Personally, when I look at what we have experienced since we started. The most moving moments have been the resignation of Adolfo Nicolás, so simple, so humble, and Father Lombardi’s speech to thank Fr. Nicolás. It was not just ideas, it was something affective, something that touched the hearts. And the Congregation isn’t just ideas; it is also affect, friendships and bounds, something that is part of Jesuit life since the beginnings. Ignatius and his first companions were friends: they probably argued, but they shared deeply their affection for each other. look of the Trinity, we would get disheartened. But the Trinity, with its compassion, is seeing us compassionately, with our limitations and our strengths. It is essential that we would have that perspective. Yes, we are trying to stand with Ignatius, with Francis Xavier, with Peter Faber and with the Trinity. Maybe it sounds pretentious, too much, but it is a prayerful stand towards the world and towards ourselves, and that is what is moving me during the entire experience of the Congregation.